One way to start is with a realistically proportioned head. Just a simple, egg-shaped oval divided vertically with a line so everything ends up symmetrical. A line to mark the eyes should be half way up, no higher. The line for the nose halfway between the eyes and the chin; then one for the mouth about halfway between the nose and the chin. The trick to this style is exaggeration. Now that you have the start of a normal head, there are a couple major changes. First, exaggerate the shape of the head by sharpening the chin so the jaw tapers down abruptly from the eye level. Then the eyes: Unlike a normal face where the eye line marks the middle of the eyes, the eyes are stretched down to a little above the nose. An easy way to block in eyes is with lines for the upper and lower lashes, and a rectangle for the iris. Start cleaning everything up and adding the details. Simplicity is part of the trick: a small mark for a hint of a nose, keep the mouth small, with a little shadow to suggest the lower lip. Give the lashes some flare and a downward turn and the end. The pupil should be elongated and black, the iris somewhat shaded, and there should be a highlight (on the same side of both eyes). Add simple lines for the eyebrows, and you can block in the hair. Clean up any stray lines, and add the neck (keep it thin). The bottoms of the ears should be about level with the nose. The hair should be very exaggerated--think big: If there is a part that curls up, it should curl way up. 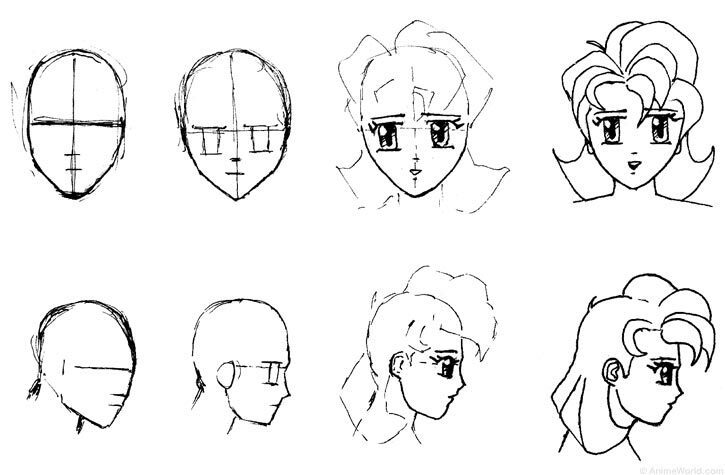 Don't draw individual hairs, think of hair as volumes that can be defined. The steps are pretty much the same for a profile-view. Don't worry too much about the ears, keep it simple and suggest the structure. The hard part is the profile edge of the face. It might take some practice to get it down, but just remember to keep it simple--it's all subtlety. The forehead slopes down and curves in at the eyebrow. The nose should be delicate, sharp and slightly upturned. The face then slopes gently down to the chin, with a little nick for the mouth. You'll soon start to develop your own style, depending on how much you want to exaggerate the features and how you want to do the details. This is just a quick way to get into it; eyes and hair in particular can be done many different ways. Look at as many artists as you can and see how others do eyes and experiment with some of your own until you find what you like. 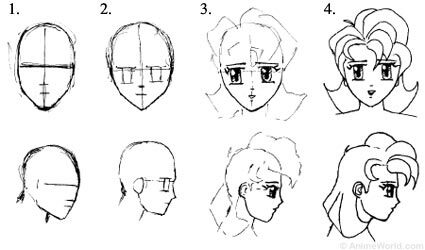 For hair you can look at other artists, but also look at real hair and hair styles and see how they can be interpreted in the anime style. And practice as much as you can! The more you draw, the better you'll get, so do as many drawings as you can and don't get discouraged or give up if they don't all turn out--just keep at it. And above all, have fun!